Unfortunately, this album is temporarily unavailable. 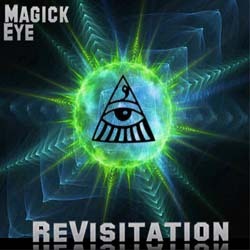 "The Magick Eye record label was formed in the early nineties and rapidly became an influential force in the underground dance, trance, prog, psych, chill scene releasing numerous critically acclaimed albums & singles worldwide from artists including Astralasia, Magic Mushroom Band, Children Of Dub and others. An offshoot label, Chameleon Records, was also formed to release music by singer/songwriters. As Magick Eye enters it's 20th year it is to start making some of its classic releases available digitally, many for the very first time. The first of these releases is a digital compilation 'ReVisitation' showcasing some of the wealth of the Magick Eye catalogue. The album is a journey beginning with Astralasia's classic 'Seven Pointed Star' transformed into an incredible never before available new vocal trance version. The album then travels through some uplifting trance courtesy of Cybernaut & Black Hole and onto some rare old school trance courtesy of innovators SYT before moving through a party anthem courtesy of UVX and onto the psych/prog sounds of the Magic Mushroom Band. The journey then continues through some mellow grooves delivered by Children Of Dub (featuring Lou Palmer on vocals) , Astralasia and Under The Honeytunnel before the final phases of the journey where we come to an end with the chill out sounds of the Magic Mushroom Band, Children Of Dub and Another Green World. Although many of the tracks have been available physically before there are some rare tracks here - the aforementioned opening track of Astralasia which has never been released before, the SYT track Echo System originally released as a12" single, the Magic Mushroom Band track 'Turban Paranoia (Bombay Mix)' originally released as an extra track on the now sold out ep 'Freshly Picked' and the 'Under The Honeytunnel' track originally a 12" only release."